Safety Catcher Hydraulic Press | Advanced Machine & Engineering Co.
"An ounce of prevention is worth a pound of cure". The old adage rings especially true for the thousands of press operators today trying to reduce their production costs and stay competitive with higher speeds, smaller batches, and - keep your fingers crossed – greater machine uptime. The cost today for a catastrophic press failure? On the low end, certainly thousands of dollars in lost production time and die replacement costs. On the high end, the loss of a key operator due to injury or a customer that takes his business elsewhere rather than run the risk of falling behind schedule again. Sure, today's most modern hydraulic and pneumatic presses have a variety of OSHA mandated protection systems in place to ensure operator safety. Guards, interlocks, electro-0sensitive and opto-electronic devices, emergency stop devices, and other redundant systems have helped make presses safer in recent years. But when it comes to safeguarding the presses themselves from expensive damage to the press or dies, standards in the U.S. fall well short of their European CEN counterpart, which states in prEN 693 Machine tools Safety Hydraulic Presses: "Where there is a risk from a gravity fall of the slide/ram a mechanical restraint device, e.g. a scotch, shall be provided to be inserted in the press with an opening stroke length of more than 500 mm and a depth of table of more than 800 mm, the device shall be permanently fixed and integrated with the press." A similar CSA Standard (Z142-02) exists in Canada. For most American press operators, however, a ratchet bar, locking bolt or latch is all that's standing between them and a catastrophic crash should hydraulic or pneumatic pressure be lost suddenly or the lifting mechanism experience a mechanical breakage. When functioning properly, the ratchet system -- usually running the length of the press stroke -- does an adequate job of arresting the fall of the ram and preventing a catastrophic crash. A spring latch will automatically extend to engage the teeth of the ratchet at some point before a crash can occur. Unfortunately, the ratchet is a wear part that after hundreds, even thousands of press cycles, can begin to exhibit signs of wear that are difficult to detect visually, and probably can't be heard, by even the most experienced operator. Over time, the ratchet teeth spring and latch typically begin to wear, since the spring latch makes contact with the teeth (but doesn't engage) on the upstroke of the ram every time the ram is raised for the next part. The ratchet, and even the end of the spring latch, can wear to the point where a fall can't be prevented. In addition, locking bolts and latches often operate only at the top of the stroke, and ratchet bars at fixed interval positions. Consequently, the ram must often be retracted to its full stroke position each and every part, despite the fact that the part requires only a short opening stroke. This can add considerable, and very expensive, non-productive time to the cycle. But in Europe, Canada, and elsewhere in the world, most presses are equipped with a SITEMA Safety Catcher, which satisfies the requirements of CEN and CSA safety standards, foolproof presses from a catastrophic crash, and allows the operator to optimize the stroke for any size part. The SITEMA Safety Catcher works a little like the "Chinese Finger Trap" you probably played with as a child. You could easily put your finger in one end of the paper cylinder, but it was very difficult to retract it. In fact, the harder you pulled the more clamping power the simple paper cylinder seemed to exert on your finger. The SITEMA Safety Catcher works in similar fashion. If hydraulic or pneumatic system pressure fails, or if a rope, chain, belt or toothed drive breaks, the SITEMA Safety Catcher prevents the load from crashing down at any position of the descent. Better yet, the system is "self-intensifying", so that as downward force increases, so too does the Safety Catcher's clamping force. 1) A cylinder rod is mounted to the top of the platen extending through the press crown and the SITEMA safety catcher housing (Figure 2). The safety catcher housing is securely fixed to the machine crown/frame and surrounds the rod which is free to move during normal operation. Wedge shaped clamping jaws inside the housing are held with hydraulic or pneumatic pressure to keep the wedges in position so that the rod can move freely. 2) This Safety Catcher instantly becomes effective when hydraulic or pneumatic pressure is lost or released. A spring causes the clamping jaws to firmly contact the rod. As a result, any downward movement of the rod initiates the "self-intensification" feature securing the load. 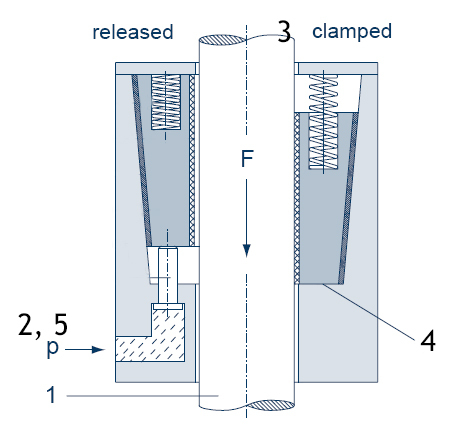 3) Significantly, the energy of the falling or sinking load is used to apply additional clamping force if needed. In other words, "self-intensifying" friction created between the clamping jaws and the cylinder rod draws the jaws into their maximum clamping position after only a few millimeters of movement. 4) If the load continues to increase, the Safety Catcher will continue to hold the rod in a fixed position until a pre-determined static holding force limit is exceeded - (approximately 3-4 times the retain force). Beyond that point, the Safety Catcher continues to safely hold the rod, with a braking action dissipating the kinetic energy of the falling mass while it continues to resist the downward movement of the platen. 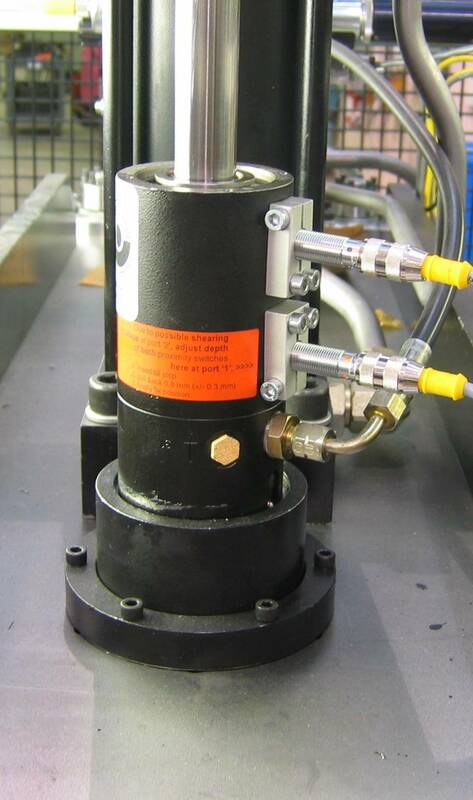 5) Only when hydraulic or pneumatic pressure is restored in conjunction with the equivalent reverse movement of the rod are the clamping wedges released, making the SITEMA Safety Catcher inherently failsafe. From presses to large hydraulic elevators to stack loaders to machine tools - in almost any application where a large load is traveling and the potential for a catastrophic mechanical failure exists - SITEMA Safety Catchers have been applied successfully and in increasing numbers, as safety standards toughen around the world. They are available in a variety of sizes to meet most common press sizes, including the very largest. Most importantly, they are readily available today in the United States through Advanced Machine and Engineering Co.